After three weeks of pleasant weather during our wonderful time in the Azores, it was time to leave. The Azores is a special place for sailors and I shall remember our visit there fondly. From Angra do Heroismo we said farewell to Jim and Kathy (Inishnee) who will eventually head to Portugal, and Rob and Josien (Inish) who will head to Ireland in a few days. 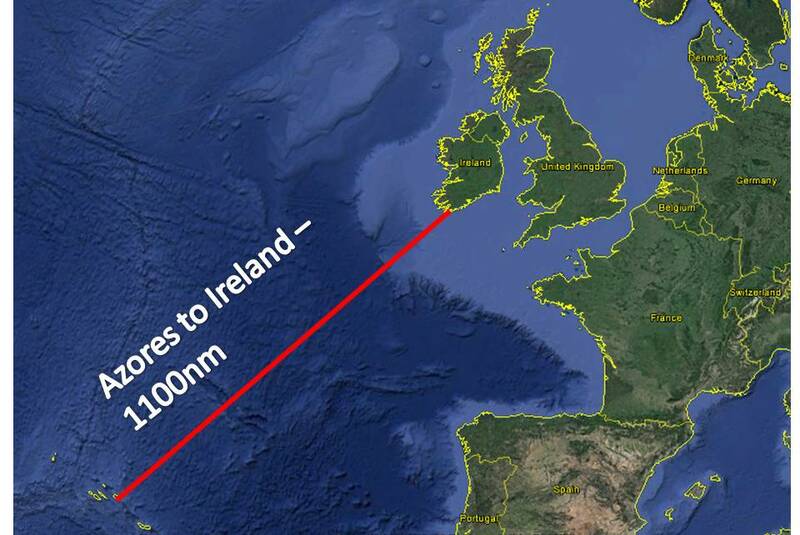 This North Atlantic passage is 1100nm direct from Azores to Baltimore, Ireland – our chosen arrival port. Each morning we’ll make contact Brian and crew on Coruisk, as they left Horta at the same time we left Angra. We expect our voyage to take around ten days, so this is a relatively short crossing for us! The weather grib file showed little wind for the first couple of days and it was spot on. Leaving on Saturday 1st July, we motor-sailed for the first 40 hours with less than 5kn of wind keeping our sails set, just. In the wee hours of Monday, we finally broke away from the high hovering above the Azores, turned the engine off and sailed. Aside | This entry was posted in 2017, Azores, North Atlantic and tagged Ireland, North Atlantic, Ocean, passage. Bookmark the permalink.